The Write Taste Review of Café de Cuba tea and coffee. What is the national drink of Britain? For most people, it has to be tea, yet apart from an estate in Cornwall, the leaves are not even grown here. Tea has assumed an almost mythical status in our society, a cure-all for our ills and an established part of our way of life. However, not long ago, going to a café or a “tea room” for a “cuppa” would have been associated, sometimes negatively, with old ladies and workmen, but now this is an outdated image. Although introduced to the West around 400 years ago, the origins of tea drinking go back thousands of years to 2737 B.C. when, according to legend, it was discovered by the Chinese Emperor. For many years after that, tea was then used primarily for health reasons. In contrast, coffee has a much more recent history and spread from Yemen through the Middle East in the 15th and 16th centuries and then to Europe in the 17th century. However, there is some evidence that the history of the coffee bean began in Ethiopia and was brought to Yemen around the 6th century. Tea has become fashionable again with modern tea rooms and tea bars attracting people of all ages around the world. Gourmet tea establishments can be found everywhere stocking many varieties of tea, especially blends. Green tea and herbal teas are also being seen as increasingly fashionable, especially for the health conscious. Coffee, on the other hand, has for years benefited from a sexier, younger and more trendy image. The smell and atmosphere that coffee brings to a room, the resulting social and intellectual interaction and the sheer taste and effects of caffeine cannot be denied. A rivalry has almost developed between coffee and tea aficionados, but is the gap narrowing as more consumers find fashion in the tea world and health benefits in the coffee world? Café de Cuba is a company which distributes quality tea and coffee with a modern image within the UK and Ireland. In fact, they have exclusive distribution in these markets on all export brands of Cuban Coffee. Although principally supplying the on-trade, they also provide an online ordering service for home consumers. Café de Cuba also sells a range of organic teas sourced from Cha Teas. These are all 100% single estate teas, handpicked from the slopes of the Himalayan and South Indian Nilgiris mountain ranges. This 100% pure black organic tea has a mild and delicate aroma and flavour. It is a refreshing tea suitable for all times of the day. This organic black tea is made with natural essences of bergamot and vanilla. The bergamot certainly does not overpower, giving gentle and fragrant orange notes. This is a lovely example of an Earl Grey, equally delicious with milk or without. This refined, delicate and refreshing drink has none of the bitterness sometimes associated with green tea. It is perfect for a mid-afternoon pick-me-up. This organic green tea has natural mint essence added to give it a delicate and smooth flavour. The mint is not overpowering and the result is a light, refreshing green tea with a hint of mint freshness. This organic green tea has naturally extracted flavours of strawberry, raspberry and cherry. Characterised by gentle, fragrant fruit aromas and a refined, delicate flavour, it has a smooth finish without any bitterness. 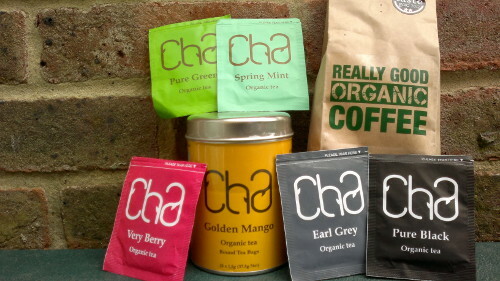 Cha Very Berry Organic Tea received a Gold Star in the UK Great Taste Awards 2012. This refreshing organic green tea contains natural mango essence. It has a gentle aromatic smell and flavour which are unmistakeably mango. This award-winning coffee is made using 100% Arabica coffee beans from small Peruvian farms. Hints of vanilla and chocolate on the nose are matched perfectly on the palate and this is followed by a smooth aftertaste with notes of roasted nuts. No wonder this coffee won two Gold Stars in the UK Great Taste Awards 2012. Tea and coffee are constantly reinventing themselves with new twists and flavours coming on to the market all the time. Every town centre and most high streets now have cafés or specialist tea or coffee shops, serving regular “cuppas”, herbal teas, cappuccinos, lattes, flavoured teas and coffees (hot and cold) and a myriad of variations on the above. What will the future hold, say in 10 years’ time? Will we see more specialist outlets, retailers and producers or will continuing economic instability and reduced disposable income oversee a decline in consumer demand? I reckon that despite these times of financial austerity, there will always be a demand for these commodities and the places that provide them. The nation’s love affair with tea and coffee is a bubble that will not burst, at least not for a very long time indeed. Café de Cuba intend to keep that going!